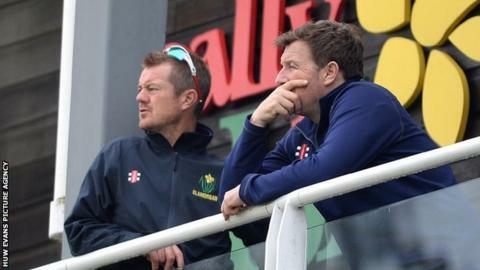 Glamorgan bowling coach Robert Croft believes scrapping the toss in County Championship Division Two matches could benefit the game. The England and Wales Cricket Board will discuss the plan on Thursday and it could come into effect in 2016. Former England Test spinner Croft believes it could mean better pitches. "I guess what they're trying to do is produce pitches that are capable of developing all round skills in the game," said Croft. If the plan is approved, a one-year trial will take place in 2016 to try to improve pitches and encourage spin bowlers. The away team would choose whether to bat, bowl or still have a toss if the pitch condition was uncertain. The ECB believes many matches in Division Two are decided by the toss because home teams are producing pitches to suit their bowlers. However, no team in the County Championship has been deducted points for preparing a poor pitch since 2011. "This is borne out of pitches in recent times being far too bowler friendly and games being over very quickly indeed," added Croft, who took more than 1,000 wickets during his playing career with Glamorgan. "They want pitches that are not just seam bowler friendly but batsman friendly and spin friendly, so I guess it's trying to even the balance of pitches throughout the game in this country to hopefully benefit all the skills which will hopefully benefit the national team. "It's a move we have to be open minded about - the toss has been there pretty much since the game started so it's very easy to get closed minded about it and say we can't mess with tradition. "But the development of the game is bigger than the toss. "And also we have to think of the supporters. They expect to see a good game of cricket that finishes about tea time on the last day ideally, but a lot of the games now are over in two days or just barely into the third day."